The wizard’s class skills are Appraise (Int), Craft (Int), Fly (Dex), Knowledge (all) (Int), Linguistics (Int), Profession (Wis), and Spellcraft (Int). Wizards are proficient with the club, dagger, heavy crossbow, light crossbow, and quarterstaff, but not with any type of armor or shield. Armor interferes with a wizard’s movements, which can cause his spells with somatic components to fail. A wizard casts arcane spells drawn from the sorcerer/wizard spell list. A wizard must choose and prepare his spells ahead of time. Starting Spells (See Spellbooks below): A wizard begins play with a spellbook containing all 0-level wizard spells (except those from his opposed schools, if any; see Arcane Schools) plus three 1st-level spells of his choice. The wizard also selects a number of additional 1st-level spells equal to his Intelligence modifier to add to the spellbook. At each new wizard level, he gains two new spells of any spell level or levels that he can cast (based on his new wizard level) for his spellbook. At any time, a wizard can also add spells found in other wizards’ spellbooks to his own (see Magic). Spells Gained at a New Level: Wizards perform a certain amount of spell research between adventures. Each time a character attains a new wizard level, he gains two spells of his choice to add to his spellbook. The two free spells must be of spell levels he can cast. 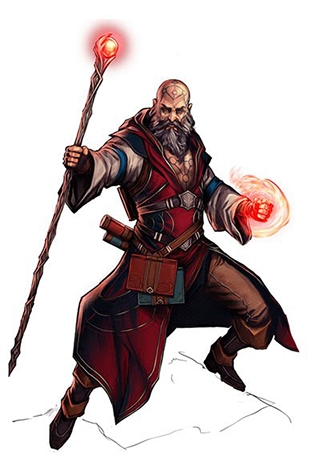 A wizard may substitute Draconic for one of the bonus languages available to the character because of his race. Can you identify an item that is the subject of an arcane bond from a wizard with detect magic or a similar affect, even if the item contains no other enchantments? Since the arcane bond class feature, when tied to an item, grants a wizard the ability to cast any one spell, it is safe to assume that it does radiate magic when it is the subject of detect magic. The aura power would be directly related to the highest level spell it could be used to cast, but there would be no school associated with the item unless it was further enchanted. Can I dismiss my familiar so I may select a new familiar? This isn’t addressed in the rules anywhere, but yes, you should be able to dismiss a familiar if you want to select a new one. However, you must still wait 1 week and pay 200 gp for the 8-hour ritual. Dismissing a familiar is ending a link between your soul and it, so it should probably take about an hour. The exception to the above is if you take the Improved Familiar feat, which allows you to immediately replace your familiar with the new familiar, at no cost or time required (it is assumed this occurs during whatever preparations you make while leveling up). Once dismissed, an animal familiar is just a normal animal of its type (a special familiar from the Improved Familiar feat reverts to a normal creature of its type). Whether or not it wants to remain with you is up to your GM and probably based on how you treated the creature while it was your familiar. At 1st level, wizards form a powerful bond with an object or a creature. This bond can take one of two forms: a familiar or a bonded object. A familiar is a magical pet that enhances the wizard’s skills and senses and can aid him in magic, while a bonded object is an item a wizard can use to cast additional spells or to serve as a magical item. Once a wizard makes this choice, it is permanent and cannot be changed. Rules for bonded items are given below, while rules for familiars are located here: Familiars. Wizards who select a bonded object begin play with one at no cost. Objects that are the subject of an arcane bond must fall into one of the following categories: amulet, ring, staff, wand, or weapon. These objects are always masterwork quality. Weapons acquired at 1st level are not made of any special material. If the object is an amulet or ring, it must be worn to have effect, while staves, wands, and weapons must be held in one hand. If a wizard attempts to cast a spell without his bonded object worn or in hand, he must make a concentration check or lose the spell. The DC for this check is equal to 20 + the spell’s level. If the object is a ring or amulet, it occupies the ring or neck slot accordingly. A bonded object can be used once per day to cast any one spell that the wizard has in his spellbook and is capable of casting, even if the spell is not prepared. This spell is treated like any other spell cast by the wizard, including casting time, duration, and other effects dependent on the wizard’s level. This spell cannot be modified by metamagic feats or other abilities. The bonded object cannot be used to cast spells from the wizard’s opposition schools (see arcane school below). A wizard can add additional magic abilities to his bonded object as if he has the required Item Creation Feats and if he meets the level prerequisites of the feat. For example, a wizard with a bonded dagger must be at least 5th level to add magic abilities to the dagger (see Craft Magic Arms and Armor feat). If the bonded object is a wand, it loses its wand abilities when its last charge is consumed, but it is not destroyed and it retains all of its bonded object properties and can be used to craft a new wand. The magic properties of a bonded object, including any magic abilities added to the object, only function for the wizard who owns it. If a bonded object’s owner dies, or the item is replaced, the object reverts to being an ordinary masterwork item of the appropriate type. A wizard can choose to specialize in one school of magic, gaining additional spells and powers based on that school. This choice must be made at 1st level, and once made, it cannot be changed. A wizard that does not select a school receives the universalist school instead. Each arcane school gives the wizard a number of school powers. In addition, specialist wizards receive an additional spell slot of each spell level he can cast, from 1st on up. Each day, a wizard can prepare a spell from his specialty school in that slot. This spell must be in the wizard’s spellbook. A wizard can select a spell modified by a metamagic feat to prepare in his school slot, but it uses up a higher-level spell slot. Wizards with the universalist school do not receive a school slot. Instead of specializing in a focused arcane school of magic, a wizard can choose to specialize in one of the elemental schools of magic. Like a normal arcane school, an elemental school grants a number of school powers and one bonus spell slot of each level the wizard can cast, from 1st on up. This bonus spell slot must be used to prepare a spell from the elemental school’s spell list. Unlike a normal arcane school, each elemental school requires the wizard to select his opposed element as his opposition school (air opposes earth, fire opposes water). He does not need to select a second opposition school. He must expend two spell slots to prepare a spell from his opposed elemental school as normal. Wizards can prepare a number of cantrips, or 0-level spells, each day, as noted on Table: Wizard under “Spells per Day.” These spells are cast like any other spell, but they are not expended when cast and may be used again. A wizard can prepare a cantrip from an opposition school, but it uses up two of his available slots (see below). At 1st level, a wizard gains Scribe Scroll as a bonus feat. At 5th, 10th, 15th, and 20th level, a wizard gains a bonus feat. At each such opportunity, he can choose a metamagic feat, an item creation, or Spell Mastery. The wizard must still meet all prerequisites for a bonus feat, including caster level minimums. These bonus feats are in addition to the feats that a character of any class gets from advancing levels. The wizard is not limited to the categories of Item Creation Feats, Metamagic Feats, or Spell Mastery when choosing those feats. A wizard may also choose an Arcane Discovery that he qualifies for in place of a bonus feat at these levels. A wizard must study his spellbook each day to prepare his spells. He cannot prepare any spell not recorded in his spellbook, except for read magic, which all wizards can prepare from memory. A wizard begins play with a spellbook containing all 0-level wizard spells (except those from his opposed schools, if any; see Arcane Schools) plus three 1st-level spells of his choice. The wizard also selects a number of additional 1st-level spells equal to his Intelligence modifier to add to the spellbook. Wizards can add new spells to their spellbooks through several methods. A wizard can only learn new spells that belong to the wizard spell lists (see Magic). Wizards perform a certain amount of spell research between adventures. Each time a character attains a new wizard level, he gains two spells of his choice to add to his spellbook. The two free spells must be of spell levels he can cast. A wizard can also add a spell to his book whenever he encounters one on a magic scroll or in another wizard’s spellbook. No matter what the spell’s source, the wizard must first decipher the magical writing (see Arcane Magical Writings). Next, he must spend 1 hour studying the spell. At the end of the hour, he must make a Spellcraft check (DC 15 + spell’s level). A wizard who has specialized in a school of spells gains a +2 bonus on the Spellcraft check if the new spell is from his specialty. See Writing a New Spell into a Spellbook for associated costs. Instead of receiving an additional skill rank or hit point whenever they gain a level in a favored class, some races have the option of choosing from a number of other bonuses, depending upon their favored classes. The following options are available to the listed race who have wizard as their favored class, and unless otherwise stated, the bonus applies each time you select the listed favored class reward.